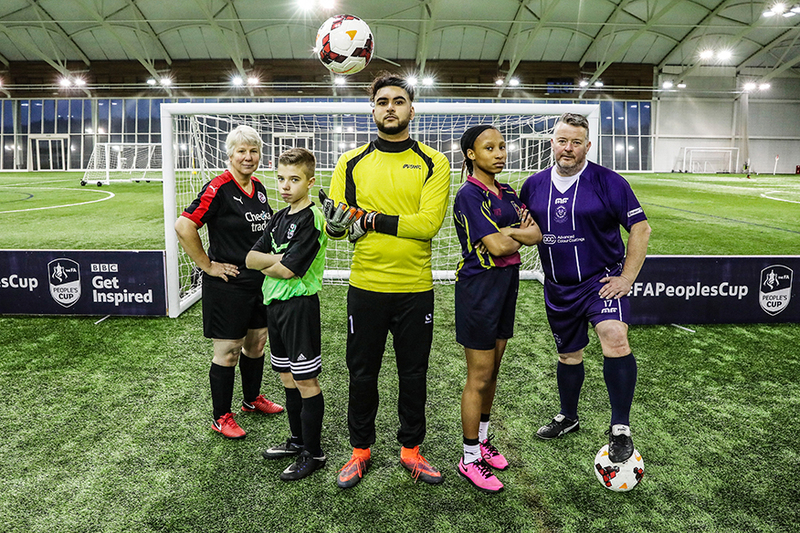 The FA People’s Cup is back following a very special launch event at St. George’s Park (on Friday 12 January), turning dreams of lifting a trophy at Wembley Stadium into a reality for people all over the country. And with registration to the free-to-enter five-a-side tournament now open to amateur players of all ages and abilities, people can dust off their boots in preparation for the nation’s largest and most inclusive small sided football competition. To celebrate the launch, a diverse group of amateur players came together at the National Football Centre to take part in The FA’s first ever specialist five-a-side training camp, taking the opportunity to hone their five-a-side-football skills ahead of this year’s tournament. Attendees, including U14 girls and boys, university students, disability players and walking footballers, took part in expert sessions with elite FA coaches, with advice on perfecting the often match-deciding ‘one-step- penalty’ and mastering the ‘showboating skills’ needed to beat your opponents in style. Those in attendance were also able to follow in the footsteps of England’s 28 National teams by playing on the pitches at St. George’s Park, which will host the Finals of this season’s FA People’s Cup for the first time in the competition’s history. One of the teams in attendance at the training camp were the Crawley Old Girls, a side who reached the Finals of last year’s FA People’s Cup in the Women’s Vets category (over 35s). The team, who describe themselves as “a group of ‘old’ girls learning to play football while having fun and making new friends”, are a great example of the inclusive and positive nature of the competition. Les Howie, Head of Grassroots Football for The FA, said: “The FA People’s Cup is extremely important to grassroots football in this country, providing a fantastic opportunity for people to play the game we all love. With 18 categories welcoming a truly diverse set of entrants, this competition really is for all. And with the added appeal of a final at St. George’s Park, 2018’s tournament is set to be the best yet”. Teams and individuals are able to enter the tournament by visiting www.TheFA.com/FAPeoplesCup where they can find more details on the competition and how to sign up. What Are The Benefits To Being More Inclusive?